Apassionata offers an enormous variety of exciting functions. Various aspects of horse care, such as feeding and grooming, are covered by the game. Petting the horses, trail rides, and training activities performed daily at any riding stable - are also part of the game. In two shops, players get to dress up their avatars, and purchase equipment and accessories for their horses. It has the best graphics EVER. It's fun to compete and train, though I had a hard time with teaching the dressage. The most realistic thing about it was..... well.... you horse! It makes real noises and comes when you whistle into the microphone. You get to pick hooves and brush with curry combs and all. You can earn money by competing. Use the money to buy cool items! I bought a set of purple plaid English tack. 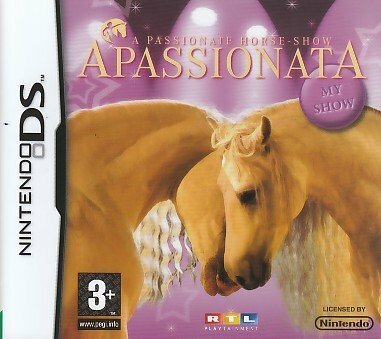 I know I'm often picky about horse games, but this one rocks!